Looking for our tours in or around Pashupatinath? Nepal’s most important Hindu temple stands on the banks of the holy Bagmati River, surrounded by a bustling market of religious stalls selling marigolds, prasad (offerings), incense, rudraksha beads, conch shells, pictures of Hindu deities and temples, tika powder in rainbow colours, glass lingams, models of Mt Meru and other essential religious paraphernalia. Some shrines were damaged in the sprawling complex surrounding the temple during the 2015 earthquake, but the main mandir was unscathed. In the weeks after the earthquake, cremation fires burning continuously on the funeral ghats alongside the Bagmati river became a defining image of the disaster. At first glance, Pashupatinath might not look that sacred – the temple is just a few hundred metres from the end of the runway at Tribhuvan Airport, overlooking a particularly polluted stretch of the Bagmati. However, in religious terms, this is a powerhouse of Hindu spiritual energy. Elsewhere inNepal, Shiva is worshipped in his wrathful form as the destructive Bhairab, but at Pashupatinath he is celebrated as Pashupati, Lord of the Beasts. Sadhus and devotees of Shiva flock to Pashupatinath from across the subcontinent and many Nepalis choose to be cremated on the banks of the holy river. Even the kings of Nepal used to come here to ask for a blessing from Pashupati before commencing any important journey. Nepal’s Dalit (‘untouchable’) community was only allowed access to the shrine in 2001. Non-Hindus cannot enter the main temple, but the surrounding complex of Shaivite shrines, lingams and ghats (stone steps) is fascinating and highly photogenic. Groups of ‘photo me’ sadhus loiter around in outlandish paraphernalia hoping to make a little money posing for tourist photos. Be respectful with your camera at the funeral ghats – you wouldn’t take snaps of bereaved relatives at a funeral back home, so don’t do it here. 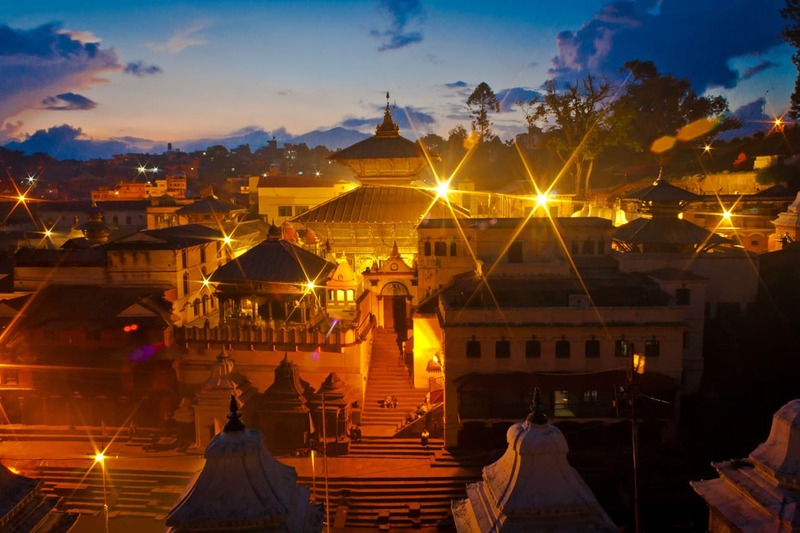 You can visit Pashupatinath as a half-day trip from central Kathmandu and walk on easily to Bodhnath. The entry fee for foreigners is surprisingly high, considering non-Hindus are not allowed into the main temple, and some travellers consider it overpriced. Guides can be hired from the office of the Guide Association of Pashupatinath close to the main temple. The best times to visit are early in the morning or around 6pm during evening prayers. The following sights are all covered by the Pashupatinath entry ticket.